This post is taken from our free textbook “Analysis and Design of Composite & Metallic Flight Vehicle Structures” and defines a method for calculating the stresses due to an interference fit bushing. The method in this section is referenced to (AFFDL-TR-69-42, 1986) Section 9.16. Note that several errors in the source material have been corrected. The expression for the maximum tangential stress for the bushing: The ‘p’ and ‘B’ should be in regular font, therefore the numerator becomes ‘2pB2’ and the denominator of this expression should read ‘B2-A2’. The pressure between a lug and a bushing assembly having negative clearance can be determined by consideration of the radial displacements. This method assumes the lug acts as if it is a uniform ring around the interference fit bushing. After assembly, the increase in the inner radius of the ring (lug), plus the decrease in the outer radius of the bushing equals the difference between the radii of the bushing and ring (lug) before assembly. Maximum radial and tangential stresses for a ring (lug) subjected to internal pressure occur at the inner surface of the ring (lug). Stress corrosion. This maximum allowable press fit stress in magnesium alloys should not exceed 8000psi. 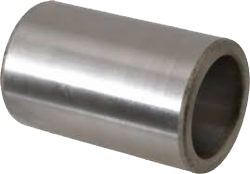 For all aluminum alloys, the maximum press fit stress should not exceed 0.50Fty. Static fatigue. For steels heat treated to above 200ksi, where there is any risk of hydrogen embrittlement the press fit stress should not exceed 0.25Ftu. Ultimate strength. Ftu should not be exceeded. However, it is rare to create stresses of this magnitude in a press fit bushing installation.